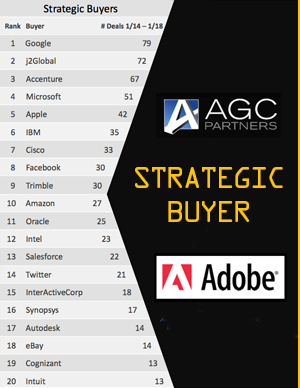 With 22 completed transactions since 2010, Adobe is an active acquirer in tech. The Company has used acquisitions to selectively expand its broad digital marketing and advertising enablement offerings. Adobe was a first mover in augmenting its cloud services platform, as evidenced by deals such as Fotilia for $800M in 2014 and Neolane for $600M in 2013. These were followed by similar deals by Oracle for Moat ($850M) and Salesforce for Krux ($800M) in 2017 and 2016, respectively, both of which exceeded 13x valuation multiples (EV to TTM revenues).